If there is any relief anyone could provide, be it prayers, well wishes, or aide in any form/fashion it would be most appreciated. I have lived in the HKA (Humble, Kingwood, Atascocita area) for around 10 years. I have been through hurricanes where we evacuated and nothing came of it, and other times when we evacuated and returned to weeks without electricity and the basic needs. Hurricanes, Tropical Storms, are quite unpredictable. Hurricane Harvey being the most unpredictable to be seen, so those not living in this area do not be quick to judge, but instead offer help. Offer support. Hurricane Harvey quickly became such a threat of unimaginable proportions, and the guidance was given as best possible with what knowledge was available. My family and I have been blessed to not have been flooded. Tornadoes have touched down around us, but not touched my home, nor my relatives home in this general area. I, personally, thank God for the blessings we have had during this turbulent and uncertain time. While not everyone has been as lucky I have seen the incredible strength of community and camaraderie that has arisen and/or developed. It is inspiring. More reviews to come, and it’s exhilarating! I’ll be working on the second book here shortly. Coming up with the refined details and plot points that will produce the culmination to the final book in the trilogy is invigorating! What an exciting week this proved to be for Snow! The Goodreads 12 Paperback Giveaway concluded as of last night, and 12 Lucky winners have been notified! There were a whopping 1,585 entries ! Considering Snow is a brand new novel from an unknown writer I (personally, in obvious biased fashion) believe this to be a positive sign. During this time over 500+ people added the book to their bookshelves . Now…just need those to equate to sales & reviews! Series & Future Titles Chosen! I feel quite proud of myself! I have determined not only the two other (final) books that will follow, but also decided on the Series name! Now I need to figure out…do I go ahead and identify that now? Some sites were asking for series descriptions, but I’m not sure if I should provide that just yet as the second is just now under construction in the early stages. Do I Care & Share, or hold off a bit longer?! I finished up reading my book the other day, and the IBGW giveaway completed with 453 entries! Congratulations to those who won! I believe that was up for a week and had that many entires, which is very inspiring for me. I hope some of those individuals who wanted a free copy will give the book a chance either way, and for anyone who is interested in still possibly winning a hard copy I have the 12 free Paperback Book Giveaways going on Goodreads! That has been up since yesterday and has seen solid traffic for entries :). It’s exciting to see the interest! I hope all who read the book enjoy and share feedback. After reading the book myself I found ways I want to improve my writing in the next book, too. I took notes of vital occurrences and habits I wished to change in the following books, in both this trilogy set and the other series I have underway. Continual improvement is my goal, there is always room for growth! Now if I could get my siren (daughter) to chill long enough for me to write and be productive! *Is listening to her frantic running in the walker* At least she’s no longer screaming! NOW OPEN! 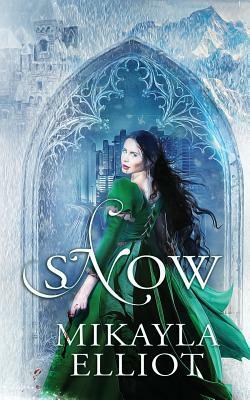 Enter to Win 1 of 12 Paperback copies of Snow! The #Goodreads #Free #Giveaway to #WIN 1 of 12 copies of the #Paperback of #Snow! The #BookGiveaway is NOW ACTIVE! Don’t miss out, and be sure to share with your friends!